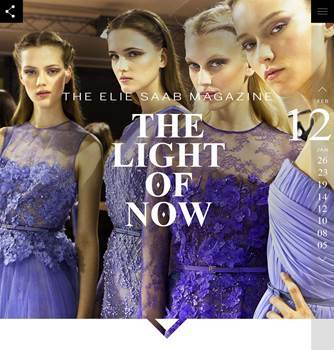 On Monday, March 3, 2014, ELIE SAAB launched of its first online magazine “The Light of Now”. Considering its loyal fan base and the rapid growth of its online engagement, the monthly e-mag will feature original editorial content at the intersection of contemporary culture and the ELIE SAAB universe. “The Light of Now” went live with the Autumn-Winter 2014/15 Ready-to-Wear fashion show, which was live streamed onto the magazine’s homepage. The project has been conceived with the aim of providing broader and more in-depth content online. It has been carefully developed within the context of ELIE SAAB’s over one million Facebook fans – which has grown over 50% yearly since the page’s founding. Similarly ELIE SAAB is one of the leading brands in terms of followers and engagement on Instagram, and also counts pages on Twitter, YouTube, Pinterest, Tumblr and Weibo. Publishing nine articles a month with an editorial team based in Paris – the home of Haute Couture – the magazine explores light as a source of inspiration across a variety of disciplines, including: design, art, music, perfume and, naturally, fashion. A dynamic mix of interviews, industry insider profiles, and articles will offer insight into the heart of craftsmanship in the creative industries. The rhythm of the content will vary from the timely and fashion-centric to more narrative approaches and unprecedented reportage on ELIE SAAB heritage in the making. 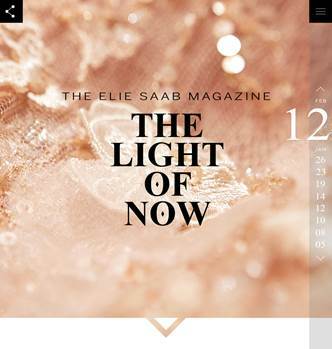 “The Light of Now” is the destination for those seeking something beautiful and also something more from ELIE SAAB, in a different light.